Note. There is now a followup to this post here. The Raspberry Pi is creating quite a storm of interest. I have just got mine and one of the first things that I wanted to try was to get it talking to an Arduino over USB using Python. .. and you know what? It proved to be a lot easier than I expected. This is mainly because, after all, despite its diminutive price tag, the Pi is just a Linux box. I got communication working both ways, with the Arduino sending 'Hello Pi' to the Pi and at the same time, testing for a digit coming in. When it receives a digit, it flashes the number of times indicated by the digit. Let's start with the Arduino end. I used an Arduino Uno and Arduino software version 1.0. I haven't tried an older board, but I suspect the FTDI generation Arduinos before the Uno may have trouble with USB. Here is the sketch - paste it into a new Arduino IDE window and load it up onto your Arduino using your regular computer. 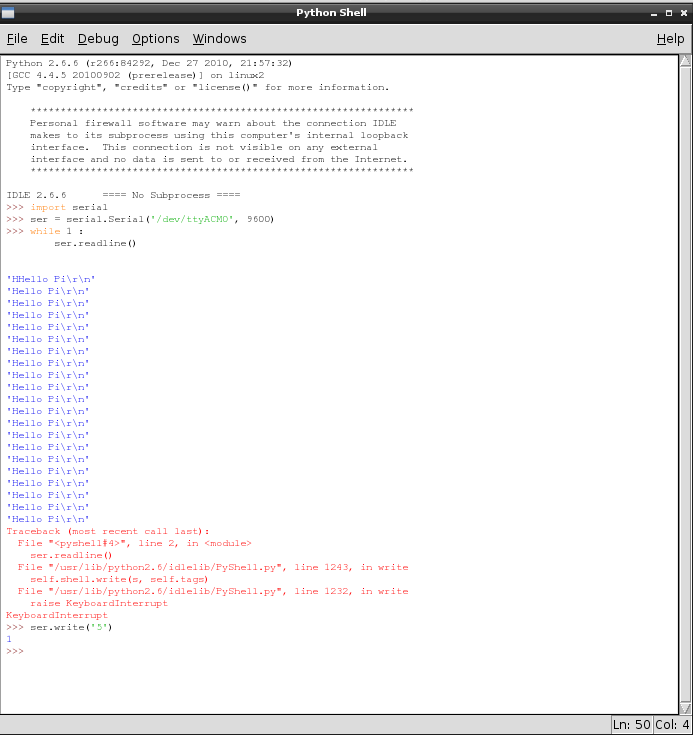 There is a Python library for serial communications called 'pySerial' which has history with Arduino. So, I stood on the shoulders of giants and adapted the instructions found here. Step 1. If you are not reading this page on your Pi, then switch now, so you can copy and paste. Step 2. Browse to here and download pyserial-2.5.tar.gz (106.3 kB) and save it somewhere convenient. I saved it to the 'other' folder on the Desktop. Step 3. This is a gziped tar file. Which needs unzipping and untaring. To unzip it open a Terminal, which you will find from the 'start menu' under 'accessories'. Now paste the following commands into it. Step 5. Run Python 2. You will find this from the menu under Programming - Use Python 2 not 3. Thats it! Now we just need to write some Python to access the Serial port. So type the commands shown in the transcript below. Note that the second argument here (9600) is the baud rate and should match whatever you put in your Arduino sketch. /dev/ttyACM0 is the name for the USB interface to the Uno, at least it was for my Uno. The way to discover the port name is to run the following command in the terminal without the Uno plugged in. Then plug in your Arduio and run the command again. If there is a new name, then this is the name of your port. Now lets start a loop listening for messages from the Arduino. You will need two hit enter twice after you type the second line. Messages should now start to appear! You can see in the Blue writing where the Arduino is talking to the Pi. Then some error trace as you press ctrl-C to interrupt the messages coming from the Arduino. you should see the LED on the Arduino flash 5 times. There are many possibilities here, we could put a motor shield or LCD shield onto the Arduino and control it from your Pi. Thanks for an interesting blog. We would be interested in covering this in our magazine the MagPi. Great article, will creat link to it on our forum, I'm sure people will be interested. Can you compare the power consumption ? How do you connect the two cylons, one usb cable between arduino and raspi? Startup 100mA settling to 70mA after 30 seconds. Just glanced at my power supply again and Pi drawing 370 mA now. I found the article really interesting. I was wondering whether you could use the same/similar commands to read an analogue input off the arduino from the pi? Esentially what i would lke to do is use the pi for back end data logging/processing. Any reason why i get no output when i use your code? 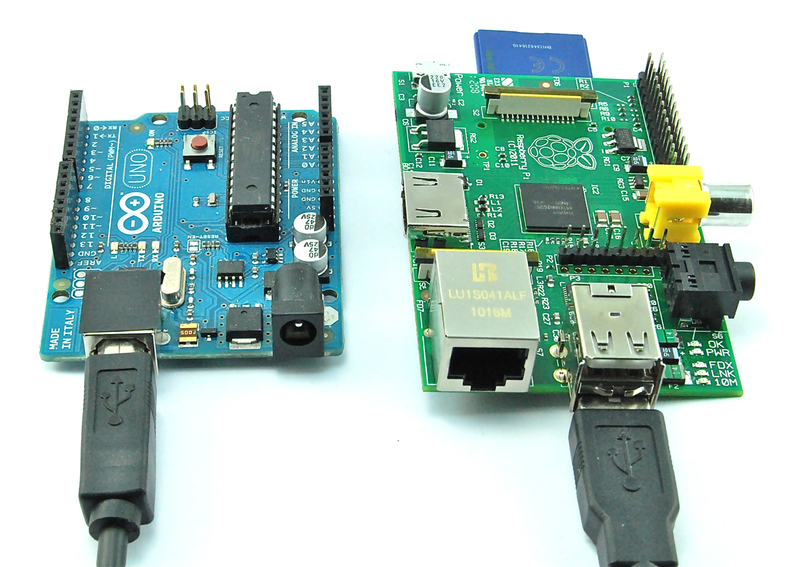 When I tried it with my Arduino Uno plugged into a powered USB hub attached to the RPi, I couldn't see ttyACM0. It works fine directly plugged into the RPi. Hey Simon, thanks for the writeup. avrdude: reading input file "build-cli/initial_playing.hex"
run step 1 and then my browser (midori),crashes when I visit this page from my raspi. Raspberry with debian and midori as a browser, the log says "out of memory", I have also installed apache, php, Mysql. Am I the only one with this malfunction? Unable to finish the tutorial, I run step 1 and then my browser crashes when I visit this page from my raspi. Raspberry with debian and midori as browser, the log says "out of memory", I have also installed apache, php, Mysql. Thank you for this article! It inspired me to try and connect the Raspberry Pi and Arduino using the GPIO UART on the Raspberry Pi and SoftSerial on two other pins on the Arduino. This way you still have the USB available for your serial monitor to do debugging with. Cant get this to work on my Duemilnove. The led on the Duemilnove flashes when the while loop is running, but no message back to the Pi. Nothing at all happens when I try the ser.write. any idea's,, hoping I dont need to replace my Duemilnove with an Uno. Somebody have an idea what this can be? Is there any way to make this script-able? I'd like to be able to read the Arduino via a Python but I can't get anything that I am sending. The post mentions you have to press enter twice to see the data. Is there anyway to include this in the script. Also, why is it necessary to press enter twice? Your article was just what I was looking for: I have mounted my Arduino to a 4-wheel chassis, connected my Pi to the Arduino and am now able to control the motors via SSH in a python shell. When I execute the script, the return value of ser.write() is 1, but the Arduino does not react (although the RX LED blinks). # Writes 'F' as in Foreward. Works in python shell. Any ideas as of what might be wrong? Your article was just what I was looking for: I have mounted my Arduino to a 4-wheel chassis, connected my Pi to the Arduino and am now able to control the motors via SSH and a python shell. Hi, thank you so much for posting this. I am having some trouble though on Raspbian. It installs fine, but there is no "Python 2" under programming. Hi. I should remind myself every time I have a problem that I actually know very little. which showed me that there was a USB device present where there was none when the Arduino was not plugged in. At this point, it is helpful to know I am using and Arduino Duemilanove and a Freeduino SB, V 2.l which is pretty much the same thing as the Duemilanove. Once I figured the new USB device listing out, I started experimenting with the code and using two Arduino's. The LEDs blink so quickly so I slowed down the blinking. When I started to enter in numbers with more than 1 digit, I found out the Arduino sketch will blink each digit in series - fun! Dr. Monk, if you have a forum or other venue for posting the differences that people have with hardware and software, it would be appreciated if you posted a link. I have not found it yet. The RPi forum would be a good place to search for that - I might start a thread. Is there any way to set a static port name for the arduino or configure so it automatically knows the port name ? The Arduino resets when a serial connection is opened. So you need to make your script wait until it is finished resetting. I have read that I can "free my pi serial port" but would like not to have to do this... how can I solve this? Arduino: 1.5.6-r2 (Windows 8), Board: "Arduino NG or older, ATmega8"
I really liked this blog post, and I was very happy when I saw the setup working! but I have one question. Why does the command ser.write('n') doesn't work with more than one digit numbers? Is there any improvisation to the code to fix this output bug?